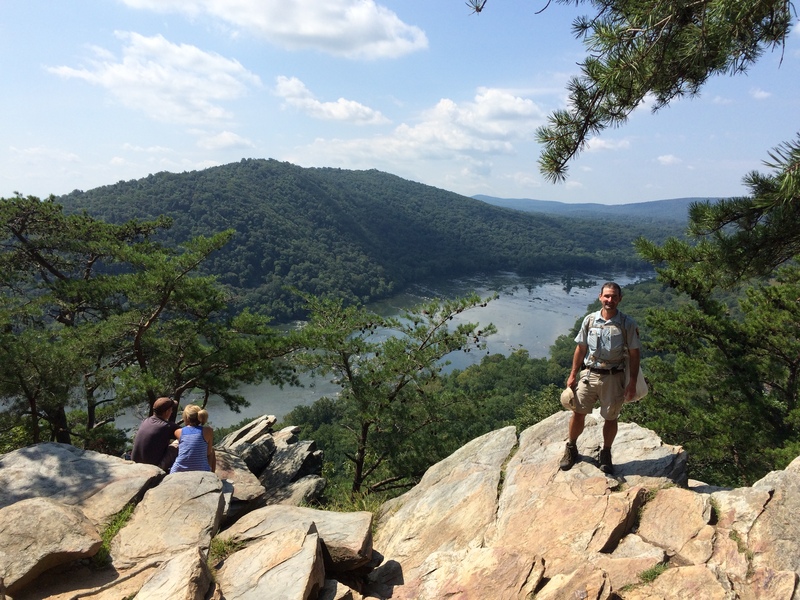 Maryland Appalachian Trail, August 28 – 29, 2015 — Many hiking guides list Maryland as the easiest state on the Appalachian Trail. Here the AT is a relatively flat ridgewalk, mostly on South Mountain. It has its share of rocks, but nothing compared to those to be experienced north and south of here. In that sense, Maryland is fortunate. In contrast, Maryland has the misfortune of being easy and close to the millions who live in the Washington, D.C. and Baltimore metro areas. That’s a lot of people, many of whom take the shortest path to the AT section nearest home. It’s a recipe for over use and abuse. That may be why the state funds two ridgerunners for just 38 miles. One starts early and the other stays through October. 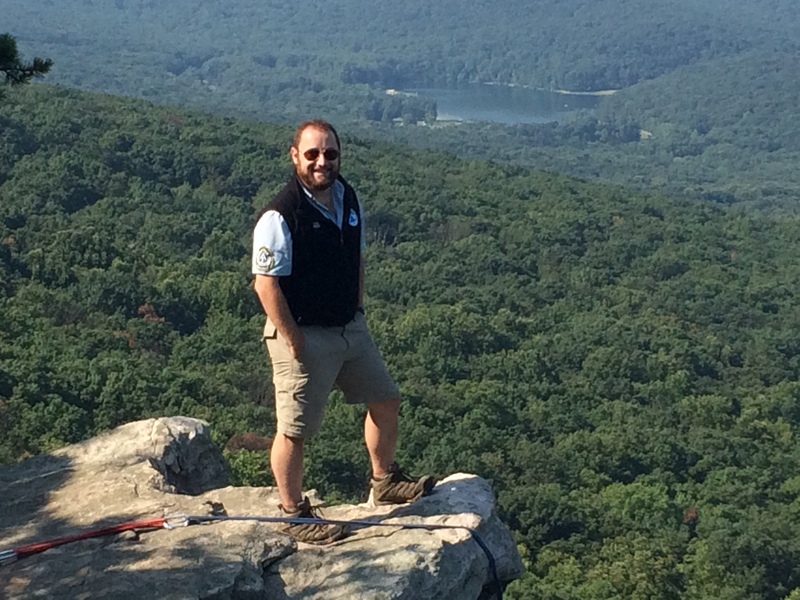 On Saturday Dan Smith and I hiked from Weverton Cliffs to Gathland State Park. These gentle miles unfold quickly. Even the hump to the top of the cliffs isn’t an outrageous challenge. Pretty much any able bodied person can make it. Come at it from Gathland and the physical challenge is even easier. Relative to the work Lauralee and I did last week in Shenandoah National Park, this southern chunk of Maryland was a piece of cake. Still, I was surprised at the amount of trash we policed up – ranging from micro trash like mylar snack wrappers to discarded/forgotten clothing. Dan said it was a light weekend. Note to self: Remember this for next year. We also broke up a couple of illegal fire rings too. Fires, except at designated fire pits at the shelters, are illegal in Maryland, but some people just don’t seem to care. Next year Dan’s off to hike the Continental Divide Trail (CDT, 3,100 miles from Mexico to Canada via New Mexico, Colorado, Wyoming and Montana.) It’s the last leg of his triple crown and I have no doubt he’ll nail it. The ridgerunner community will miss him. After repositioning Dan’s car, I left him to rush northward to spend the night at Annapolis Rocks with Max Mishkin. I made camp about two minutes before I needed to turn on my headlamp. The two Maryland ridgerunners rotate so that there’s always a caretaker on site at the Rocks. It didn’t take long to figure out why. 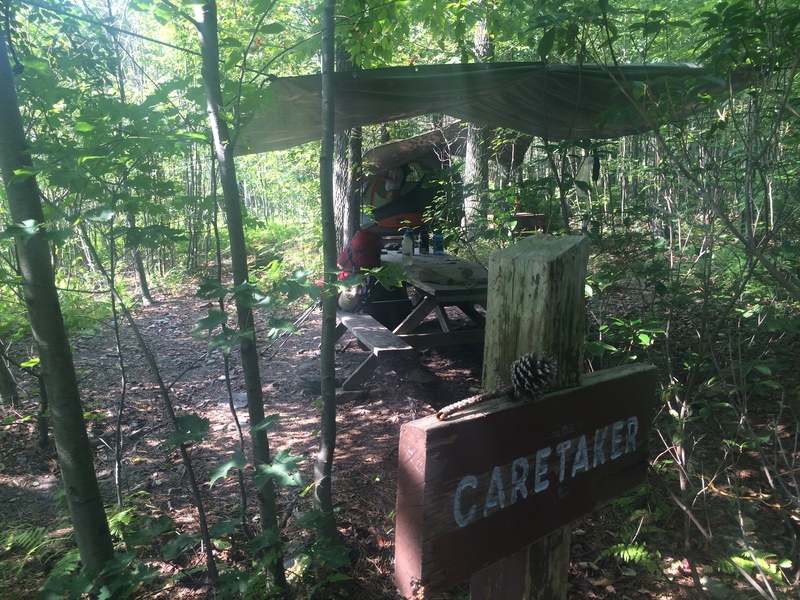 Caretaker’s tent at Annapolis Rocks. I hung my hammock nearby. 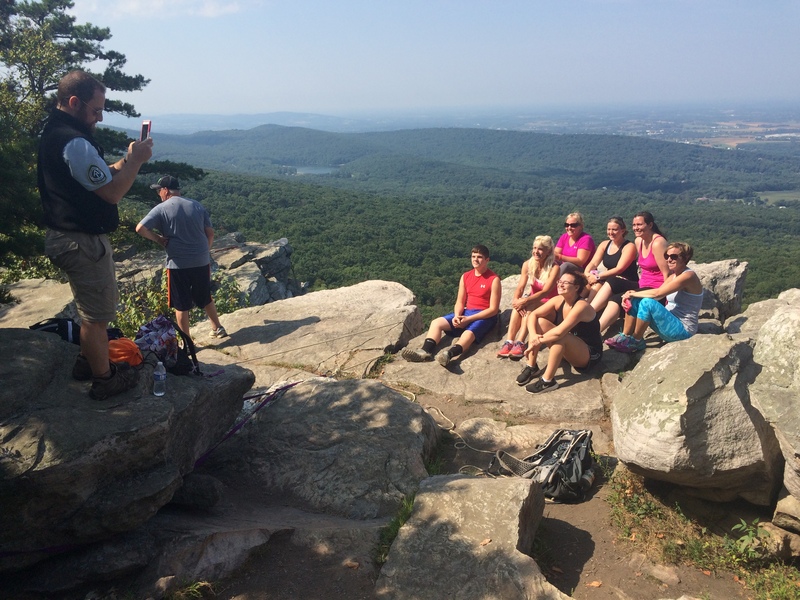 Annapolis rocks is the Grand Central Station of Maryland’s AT section. On a nice weekend, several hundred people per day have been known to visit. Most are neophyte day trippers who are unaware of the Leave No Trace principles. Consequently trash and cigarette butts figuratively snow from their presence. Outdoor organizations also frequent the Rocks. Scouts and Outward Bound groups are common. Camping is restricted to a limited number of designated sites and no fires are allowed. As I was walking in, a disgruntled father with a couple of sons was moving out with the speed of the approaching darkness. It seems that the father brought the boys to one of the most sensitive and protected places in Maryland to show his boys how to build a fire and make a lean-to. Max caught them hacking live trees and starting a fire. 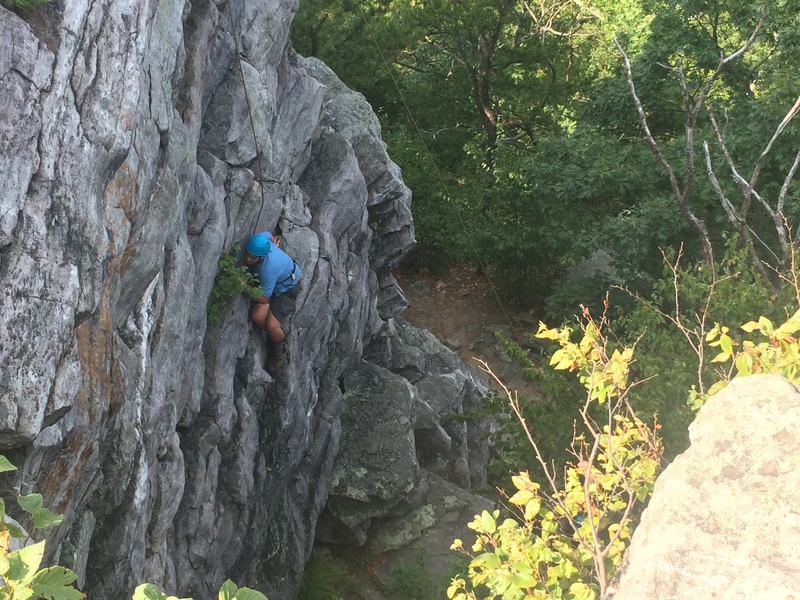 The upside to caretaking at Annapolis Rocks is obvious. People seem to love a guy with patches on his shirt. I think we found Max at central casting. Max is a jovial extrovert from Connecticut who graduated from William and Mary. Since then, he’s knocked about in political campaigns and paralegal work. On his days off, he volunteers like I do at the Appalachian Trail Conservancy Visitor Center. In early November he plans to hike Vermont’s Long Trail. I’m planning to be on that trip too if circumstances permit. I love the challenges of winter hiking. 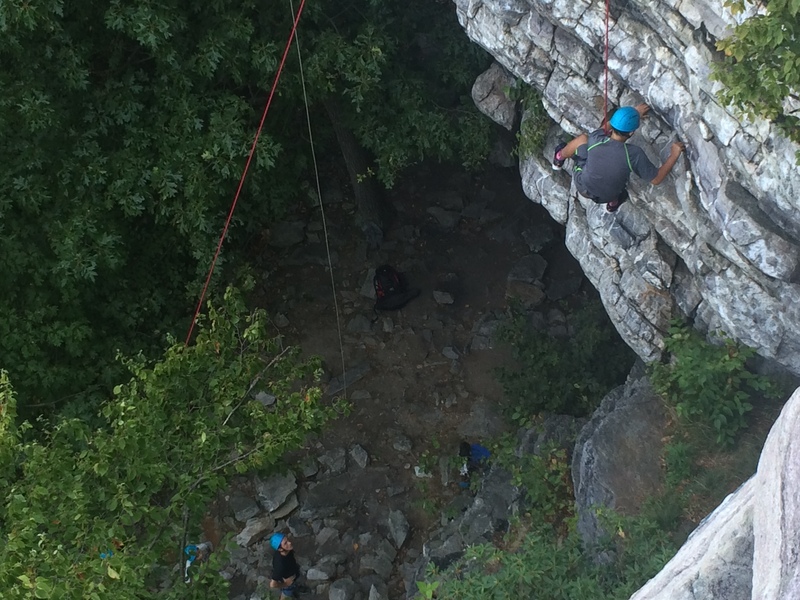 Two Outward Bound groups came in turn to climb the rocks. 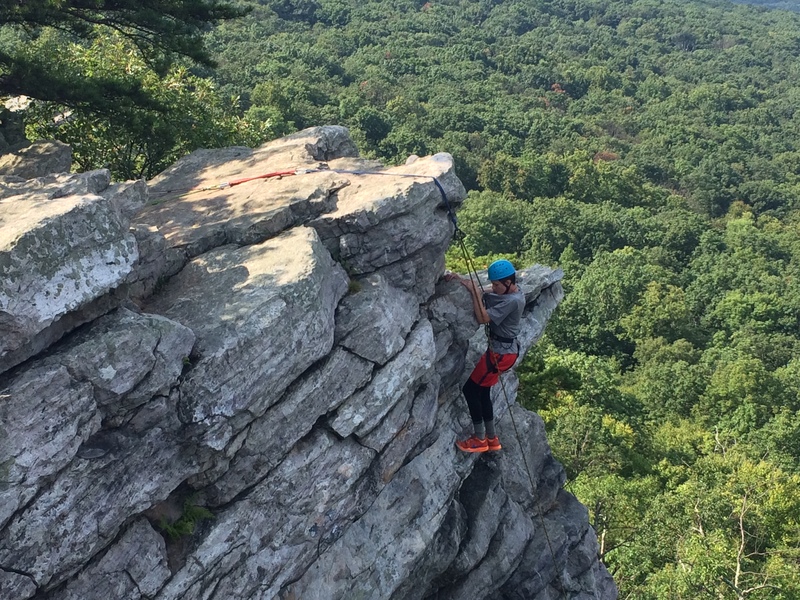 This is a climbing favorite in Maryland. The highest rated climb, Black Crack, is 5.9 on the Yosemite decimal system because it has an overhang. The others are non-technical but do require rope protection. It’s a long drop to terra firma. 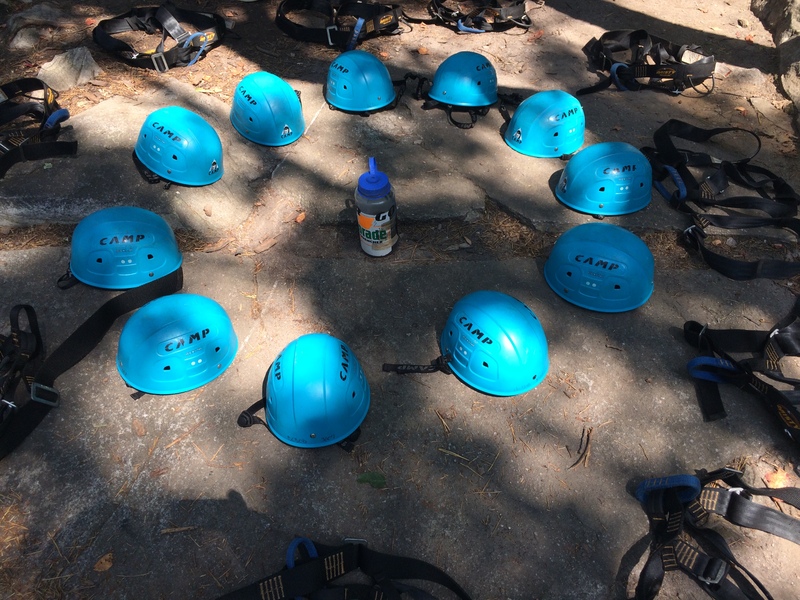 I love to see young folks learning how to climb. The rock is a hard sandstone infused with calcite. The cracks and fissures make excellent and safe handholds. The youngster on the right did an excellent job. Say it ain’t so! Buckle up your overshoes. 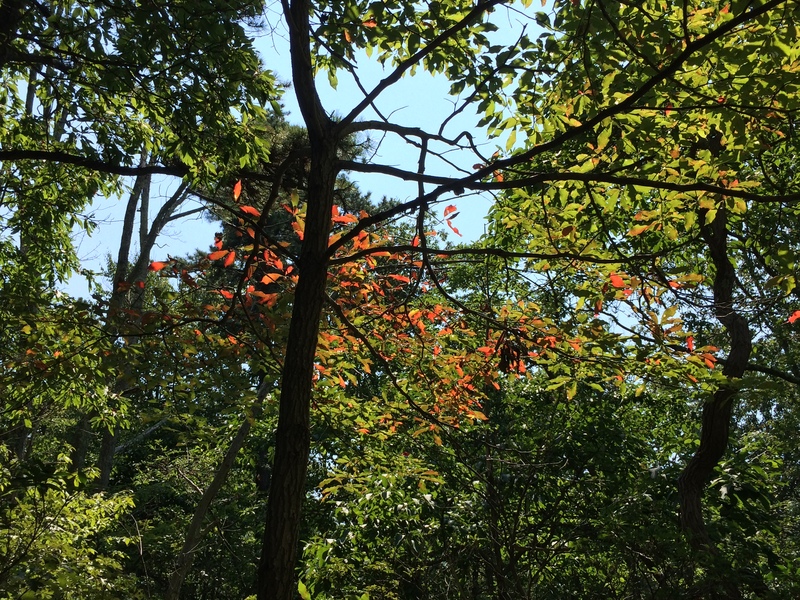 The seasonal transition is beginning. Yup, can’t fix stupid or “I’m going to stop asking “How dumb can you get” because people seem to take it as a challenge!” Thank you for all your hard work and all the crew’s hard work! I love rock climbing!! So…why do I live in the flat corn fields of IL?????? When you retire, you’ll have to move in this direction! People like you are the antidote for the other kind. We need more of them. Flat cornfields? Illinois? I grew up among many of those in western IL. Now we are surrounded by rolling cornfields here in IA. Yup, flat corn fileds of northen IL. I love to hike, kayak and rock climb. Hard to do that around here when there are no cliffs to climb! Our life goal is to visit as many nationl parks as possibe and IL doesn’t even have one of those !!!! State parks can offer good things in the interim. Good luck meeting your goal with the NPs. There are many fabulous ones. Don’t tempt me !! Bought new hiking boots at REI last night. If I could of worked it out I was thinking about wacking out NJ in Sept but looks like that won’t happen. Easy access to a beautiful area means more people to leave their traces. You want people to know about and appreciate the great places. But, they need constant monitoring and guidance. Max, Dan, you Jim, and many others are trying doing a job that will never end. Dang it! So close and I missed you. I headed to VA to hike last weekend. Love my state’s section. And the caretaker was very outgoing when I arrived at the rocks as the sun was just starting to make its way up the mountain! I hadn’t even had coffee yet…wasn’t prepared for that level of enthusiasm that early. I think I mumbled something incoherent and averted my eyes as I passed! Oh dear, poor kid.